The Criminal Justice Department at the American Samoa Community College (ASCC) has established a co-curricular organization for students called the Law Justice Club. The new organization’s objectives include improving the relationship between students with the public through community service; providing students with opportunities to enhance their leadership skills; improving criminal justice educational activities; and fostering professionalism in law enforcement and its agencies. 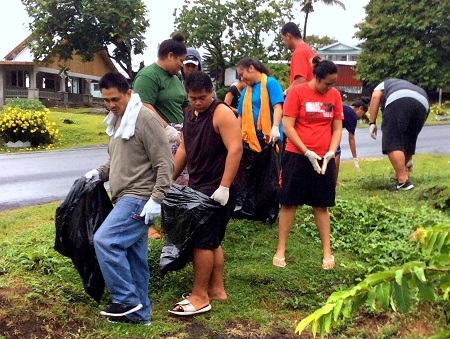 The Law Justice Club has scheduled four cleanup dates between now and April, at locations that will include the breadth of the ASCC campus where it meets the main road, Lions Park, and the stretch of Malaeimi roadside from ASCC to the Tafuna Intersection. The AS-EPA has committed to providing the club members with gloves and trash bags, and the Agency will also collect data on the number and types of discarded items collected during the cleanups. “An activity like this highlights the importance of sustaining the environment as well as the laws meant to reinforce sustainability,” said Ah Chee-Toeava. The Law Justice Club has elected as its officers Mr. Liu Lafaele, President; Mr. Fogasaua Lesa, Vice President; Ms. Dorothy Moeolo, Secretary; and Ms. Esther Fiatoa, Treasurer. Mrs. Ah Chee-Toeava shares advising duties with her department colleage Mr. Utumoe Alefosio, Faculty Advisor, and Mrs. Claire Sagapolutele-Toeava of the ASCC Business Office, Staff Advisor. The club has also recently added additional advisors Ms. Jennifer Sua, Administrative Assistant with Adult Education, Literacy and Extended Learning, and Mr. Saili Toetu, Senior Security Officer. For more information on the Law Justice Club, contact Mrs. Ah Chee-Toeava at 699-9155, extension 332. A full description of the Criminal Justice Department can be found in the ASCC Catalog, available for viewing online at: www.amsamoa.edu.